A panel of experts presented findings to city staff, development leaders and community members on Thursday, March 23, 2017 at City Hall focusing on one key issue: why equity is an investment. On Thursday morning, a panel of experts presented findings on how to incorporate equity into the development of public land in Grand Rapids. 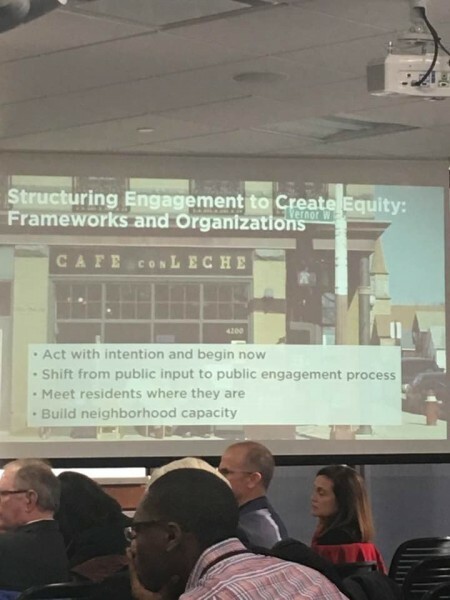 The presentation was delivered at City Hall by members of the Rose Center for Public Leadership in Land Use, jointly operated by the National League of Cities and the Urban Land Institute. As part of a yearlong fellowship, Grand Rapids Mayor Rosalynn Bliss; Kristopher Larson, president and CEO of Downtown Grand Rapids Inc.; Josh Naramore, manager of Mobile GR and Parking Department and Kara Wood, Managing Director of Economic Development for the City of Grand Rapids were selected as 2017 Daniel Rose Fellows. The three other cities that are a part of the class of 2017 are Anchorage, Alaska, San Jose, California and Washington, D.C. The national experts spent the week in Grand Rapids to learn more about community plans, learn about local development tools and programs and conduct interviews with key stakeholders. Thursday’s presentation was the first time Grand Rapids’ Rose fellows were hearing the experts’ findings. 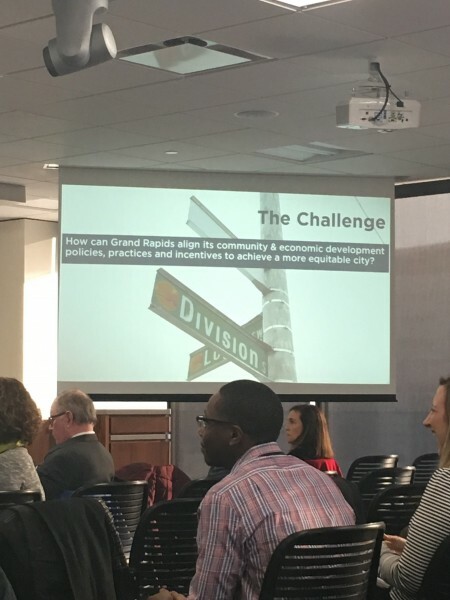 The presentation sought to answer the following question: How can Grand Rapids align its community and economic development policies, practices and incentives to achieve a more equitable city? Prioritizing equity has a big cost, but it also has big benefits. Equity (done right) lifts all boats. Antonio Fiol-Silva of SITIO Architecture + Urbanism said sixty interviews were conducted. There was broad recognition that inequities exist in the city, he said. “In this community, all need to have access to opportunity for the community to succeed,” he said. The panelists also noted that it will take cooperation and assistance from the budget of multiple agencies and multiple funding sources for equity initiatives to be implemented successfully. During the presentation, numerous community goals were discussed, including workforce development, transportation and the use of development incentives. Experts noted workforce development is critical to equity. Act with intention and begin now. Shift from public input to public engagement process. Meet residents where they are.